We have over 25 years experience in the building industry & hold a building licence (No.193668C). Extensive and ongoing work for large builders such as AV Jennings, Clarendon, Masterton & Mirvac as well as many smaller builders. We specialise, as our name suggests, in home makeovers, providing our customers with a large range of finishes to upgrade, add style & really improve the value of their homes. We have large sample panels at our office in Pennant Hills which is a great asset to builders, new home owners and home renovators. On display we have render & paint, acrylic bag & paint, 2mm trowel on (scratch coat) for exterior finishes as well as internal feature paints. 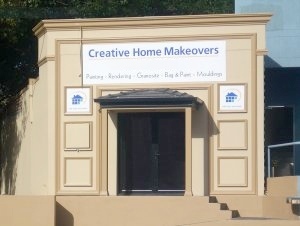 We have a workforce of Sydney's best and most experienced applicators and tradesmen as well as friendly well informed staff to help you make the right decisions for your decorative needs.